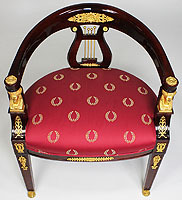 A Set of Ten French Empire Revival Style Mahogany and Gilt-Bronze Mounted Horseshoe Shaped Game Armchairs (Reproductions). 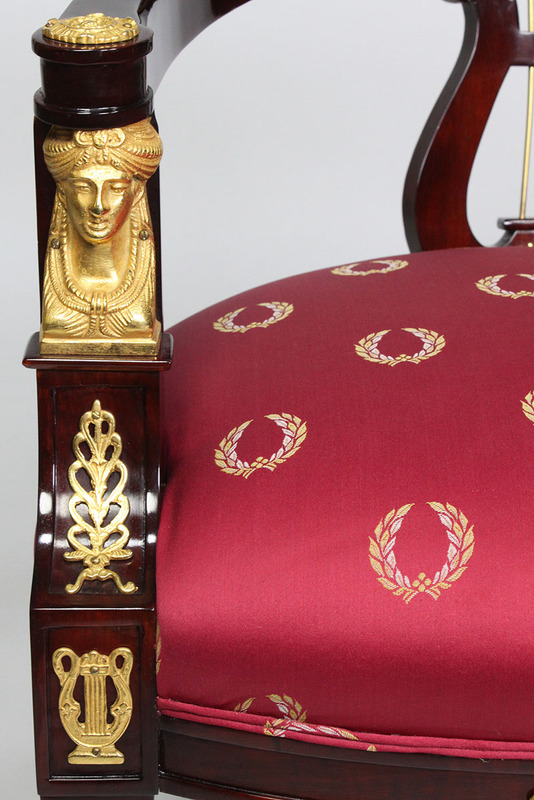 The arched back frames centered with a harp design below a laurel shield, the armrests each flanked by a pair of gilt-bronze Egyptian female heads above laurels and harps, raised on four legs, the front ones ending on paw-feet, all upholstered in a burgundy Empire style fabric with laurel wreaths. 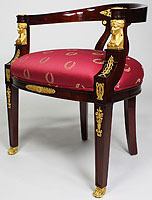 Circa: Late 20th Century. 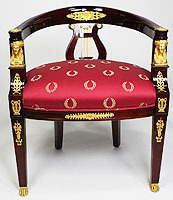 Note: Please note that we currently have a set of ten of these armchairs however we are offering them in pairs. 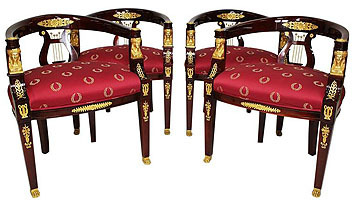 Price quoted is for each pair. 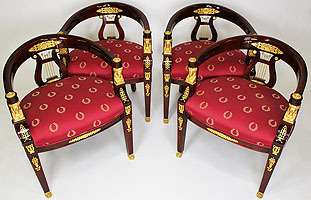 A Set of Ten French Empire Revival Style Mahogany and Gilt-Bronze Mounted Horseshoe Shaped Game Armchairs (Reproductions). 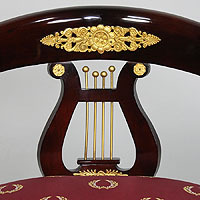 The arched back frames centered with a harp design below a laurel shield, the armrests each flanked by a pair of gilt-bronze Egyptian female heads above laurels and harps, raised on four legs, the front ones ending on paw-feet, all upholstered in a burgundy Empire style fabric with laurel wreaths. Circa: Late 20th Century. 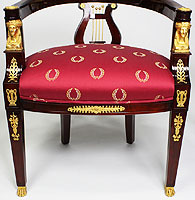 Note: Please note that we currently have a set of ten of these armchairs however we are offering them in pairs.